A Colt .45 revolver once owned by General George S. Patton sold for $75,000 at auction in Los Angeles Thursday. 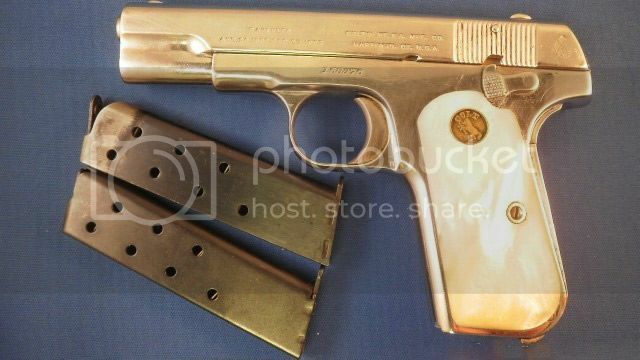 Profiles in History, which conducted the auction, had expected the working firearm to fetch over $60,000. The Colt .45 Model 1873 single-action revolver with distinctive stag horn grip was acquired by the famous World War II general around 1928. 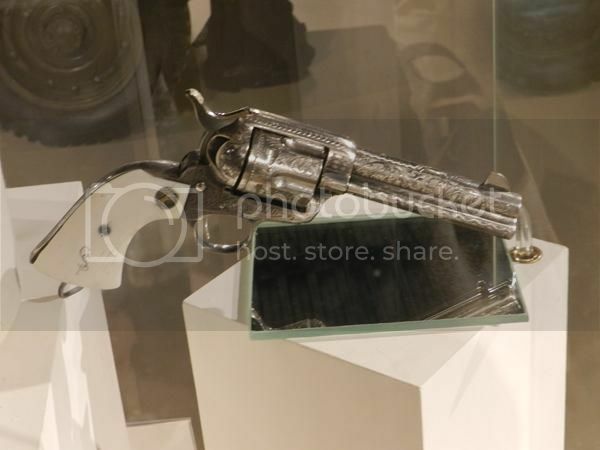 The gun, owned by Patton until his death in 1945, is often considered to be a version of his famous ivory-handled Colt. 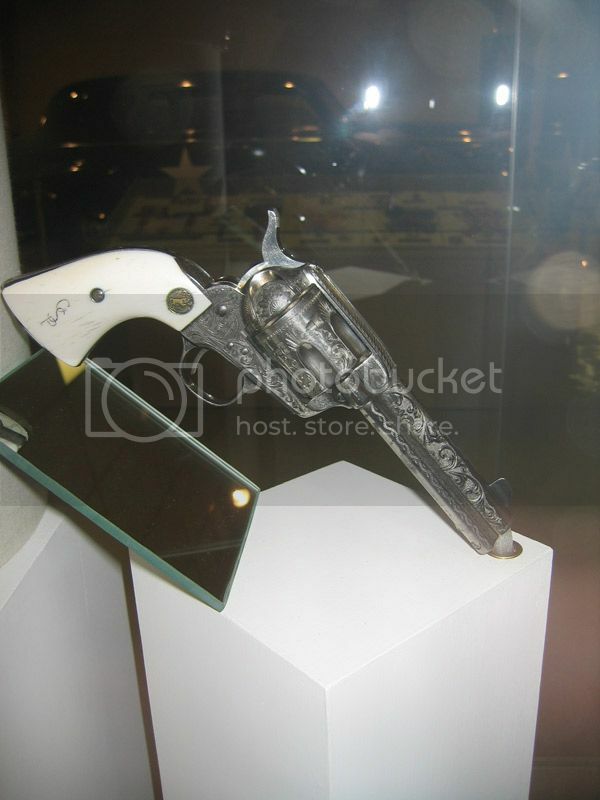 45, which is on display at The General George Patton Museum and Center of Leadership in Fort Knox, KY. The weapon’s $75,000 price tag includes the buyer’s premium. Patton initially carried twin Colt single-action Army .45 revolvers, but after he gave one of them to a Hollywood star he admired, because of the star’s courage to entertain front-line troops in combat zones, he replaced it with a 3 ½ inch Smith and Wesson .357 magnum. Part his this flamboyance was those ivory-handled revolvers. The general, however, knew the importance of inspiring his troops, and his flamboyance certainly achieved that goal. As to the question of why he carried two revolvers, rather than just one, it is well known that as a young man he was part of General Pershing’s “Punitive Expedition” into Mexico to hunt down the infamous Pancho Villa. And, on 14 May, 1914, during one of those expeditionary forays, he came under fire while leading a caravan of three vehicles to obtain food for his troops. The band of “Villistas” attempted to flee on horseback. Patton was armed with his own Colt SAA .45 revolver. Back then he carried it with the hammer down on an empty chamber, hence only five rounds. During the firefight he emptied the weapon, some believe three times. In a subsequent letter to his father, Patton wrote, “I fired five times with my new pistol and one of them ducked back into the house. I found out later that this was Cardenes and that I had hit both he and his horse.” Captain Julio Cardenes was a member of the Pancho Villa gang of thugs, and was second in command, when he was shot by then Lieutenant George S. Patton. Patton then carved a notch in his revolver’s handgrips, and removed Cardenes’ spurs as souvenirs. 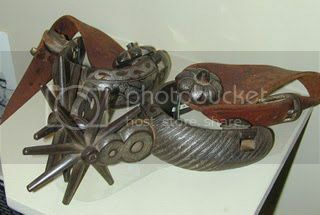 Those spurs, by the way, are now in the Museum of WWII in Natick, Massachusetts. As a young man, Patton competed in pentathlon events, which included pistol shooting, and he would practice for hours on end on his trigger pull techniques with his strong hand and off-hand positions. Patton’s obvious preference was for revolvers, but during WWII he did also carry a Colt Pocket Model hammerless, as well as a Remington Model 51 .380. It was with the Remington that he shot at a Luftwaffe airplane, as it was attempting to strafe his encampment. 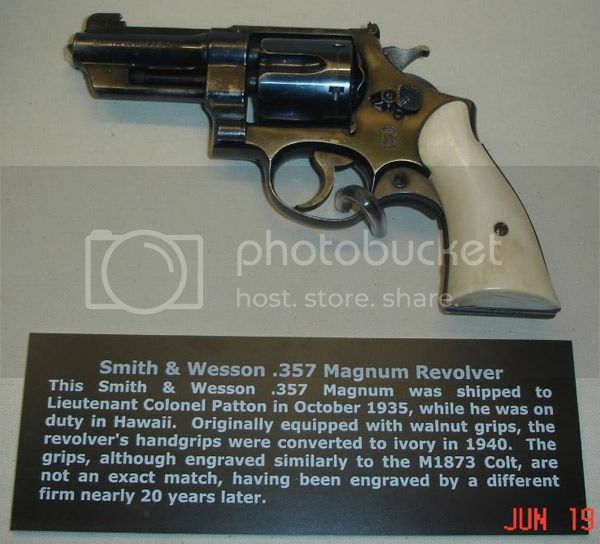 He was also known to carry a Colt Detective Special .38 revolver. All of his handguns, with the possible exception of the Remington, had the ivory grips, and some were inlaid with the initials “GSP” and had the stars of a U.S. Army general. Many American soldiers and officers, including General Omar Bradley, carried the Colt M1911 semi-automatic pistol, But General Patton only carried the 1911 on rare occasions. George S Patton in 1916 was a renaissance man in the US military. He had spent a good bit of his active service overseas. He competed in the 1912 Stockholm Olympics in the modern pentathlon, studied sword fighting in France, and even designed the last cavalry saber the US Army ever issued. The standard sidearm at the time in the Army was the brand new Colt 1911, which augmented a series of .38 caliber revolvers. Patton however wanted something with just a little bit more character. 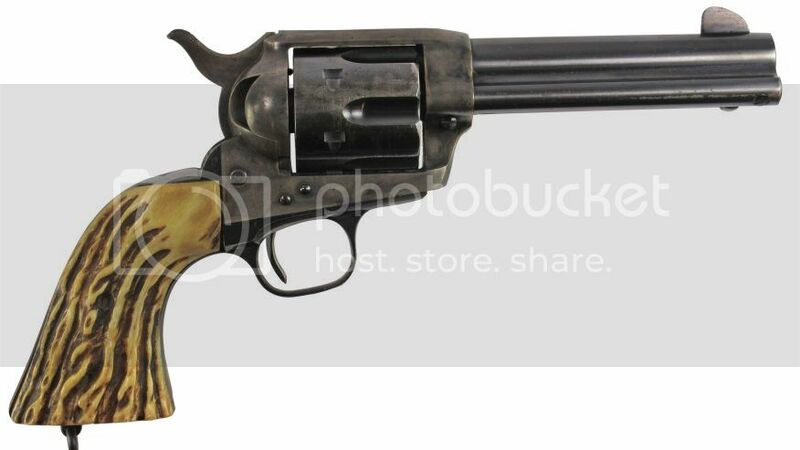 Based at Fort Bliss, he ordered from the Shelton-Payne Arms Company in El Paso for $50 a specially engraved Colt 1873 in .45 LC, serial number 332088. 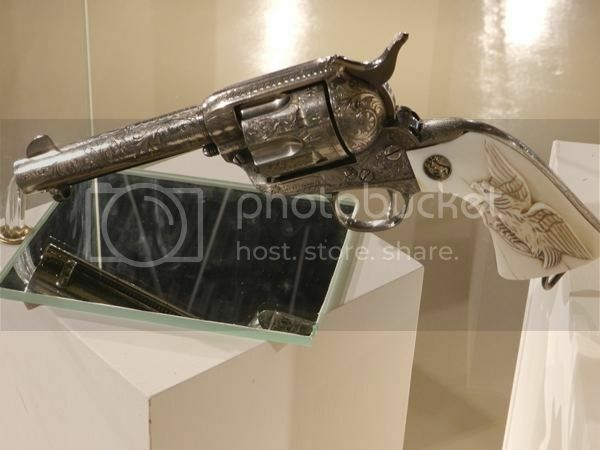 With a 4.75-inch barrel giving the six-shooter an overall length of 10.25-inches and a weight of 38-ounces, the gun was hefty. Patton requested a highly engraved silver finish along the frame and barrel. Custom Helfricht engraved, ivory grips, with 'GSP' in black enamel on the right panel and a volant eagle on the left, set the gun off. At the time, Patton's pay as a Second Lieutenant was just $155 a month, so the revolver was a large investment. He picked up the revolver from Shelton-Payne on March 5, 1916, just in time for war. Interesting read Shooter. Few Generals of today have neither the unique sidearms as Patton nor the balls. Yea Red...my favorite General from WWII ( Rommel comes in a close second ). Both had the guts to make moves on their own and defy commands from above if the situation warranted it. Both were soldiers...not politicians ! !